Atmel have released 8-bit microcontroller based RF transmitters aimed at transducer telemetry for 315Mhz and 433Mhz. Claimed to be the First Microcontroller-transmitter RF IC, the ATA6285/ATA6286 have provision for three sensors. The Atmel ® Corporation this month released a new low cost development tool for AVR ® Microcontrollers - the AVR Dragon. It supports In-System Programming, High Voltage Serial Programming, Parallel Programming, JTAG Programming. While this is a welcome addition to the toolset available for development of AVR 8 bit microcontrollers, a couple of issues should be considered. Printed circuit boards using toner transfer method. This was a first attempt at making a solid state switching or multiplexing device for audio signals. It uses 4051 chips for the actual multiplexing of signals, As such it can switch 2 banks of 8, or using th INH pin of the 4051, and connecting the inputs as common, 1 bank of 16 channels. AT90USB1286 and AT90USB646 have USB, and AT90USB1287 and AT90USB647 have USB OTG interfaces built-in to 8 bit AVR microcontrollers. This looks like a unique development tool by Texas. Containing a development platform for an MSP430F2013 on what looks like a USB memory stick. 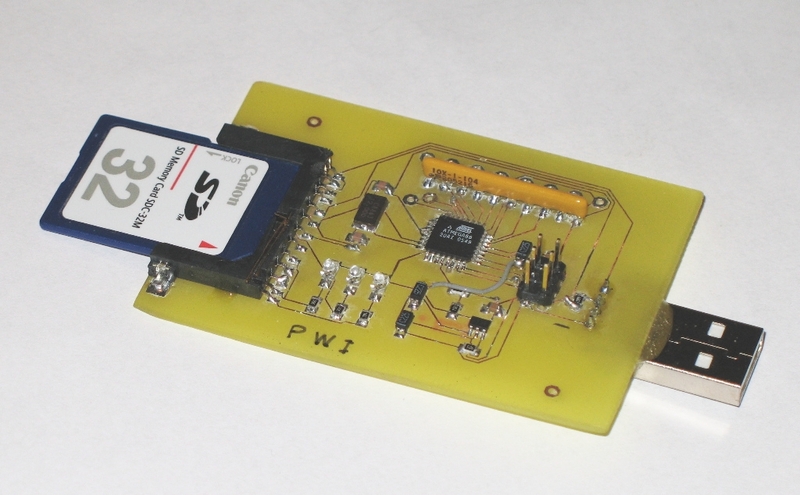 It is self contained, deriving its power from the USB bus, and has a removable target device board. TI are offering it for $20 USD including software. Should an 8 pin AVR device in the SOIC package require programming other than ISP programming, it is necessary to connect directly to the STK500 board. This situation could arise due to accidental programming of various fuses.